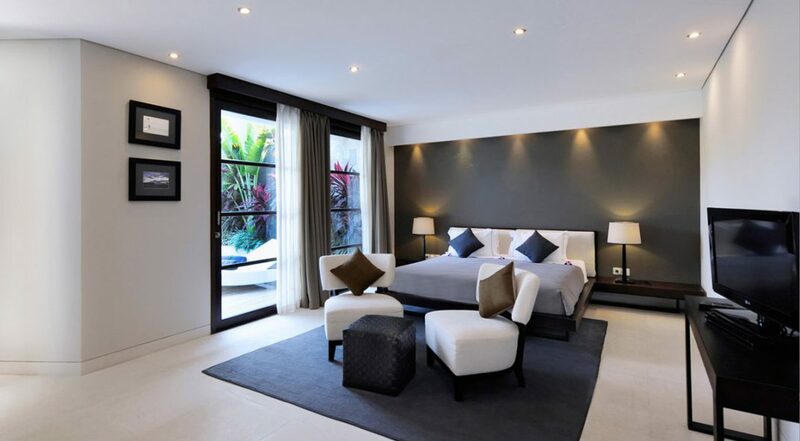 From $ 692 $ 692AUD per night We have direct contracts with most villa owners. We don't add any booking fees. We are 100% transparent with no nasty surprises. 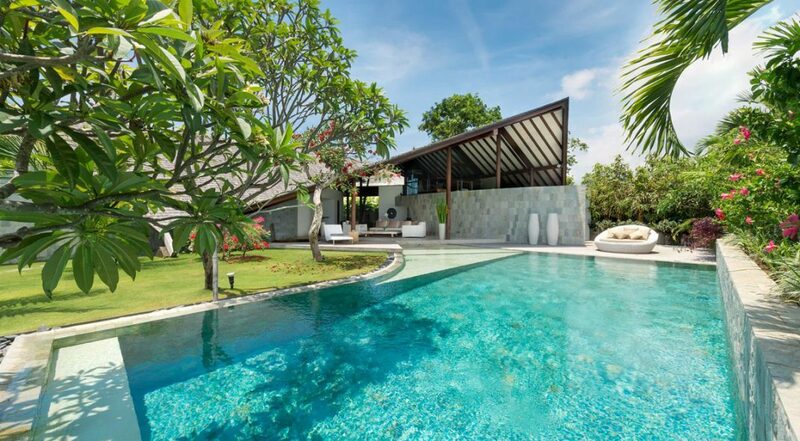 Stunning Bali villa in central Seminyak - rent this now! 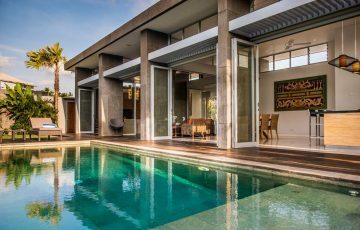 If you want to holiday in a luxurious Bali villa that’s known Bali wide for it’s architecture, design and chic hi-end appeal in a top Seminyak location, then The Layar is the perfect villa to get your heart racing. 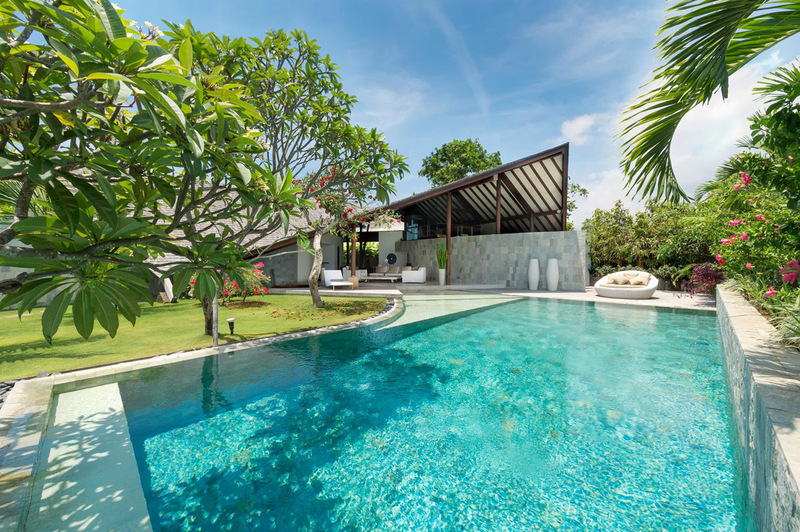 This 3 bedroom Seminyak holiday villa rental is stylish, very modern and a once in a life time holiday experience, that’s also family friendly. 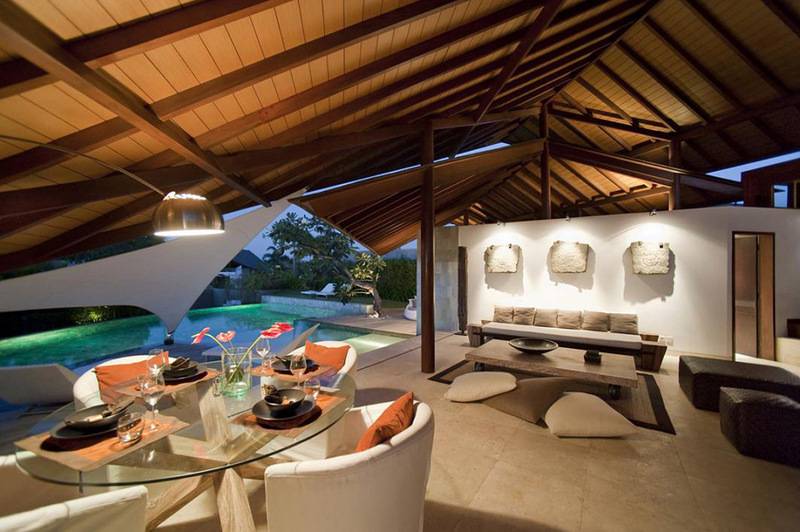 This is really open-plan Balinese tropical holiday living at its finest! 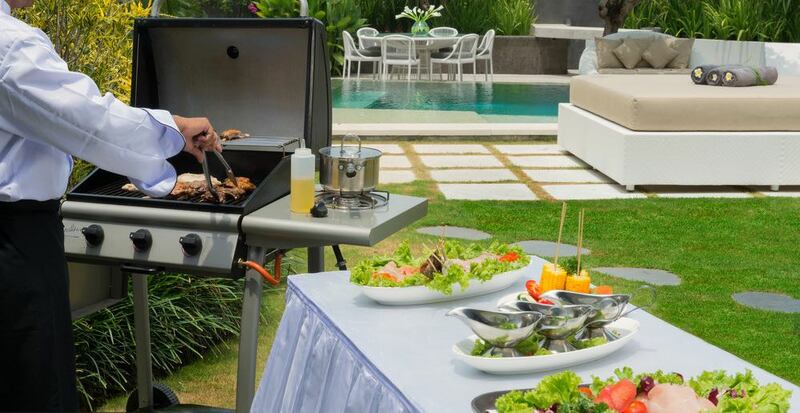 Without any compromise on design or villa amenities, you will feel like a movie star during your stay. 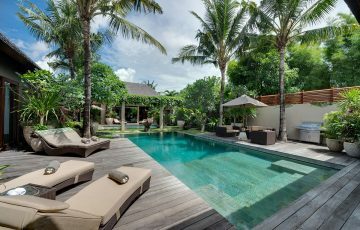 Combining a top Seminyak location with world class facilities, design and staff The Layar will be your once in a life time experience. 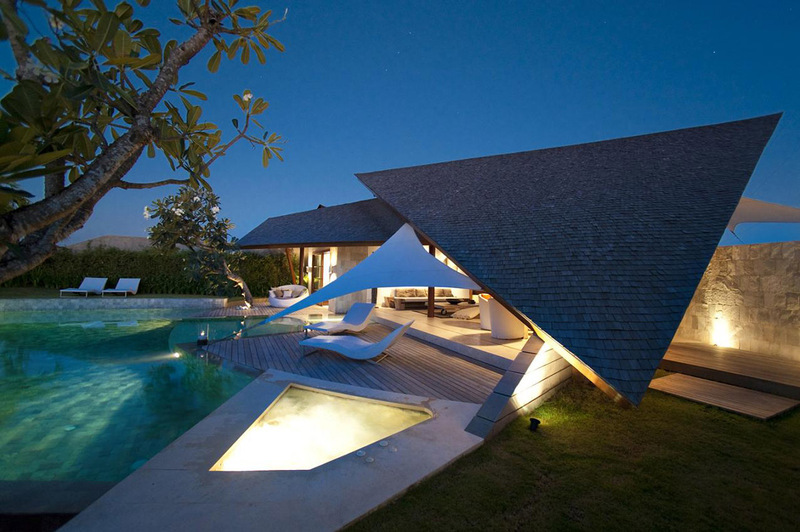 This is without doubt one of Seminyak’s best and most sort after villas with fans raving about this villa world wide. 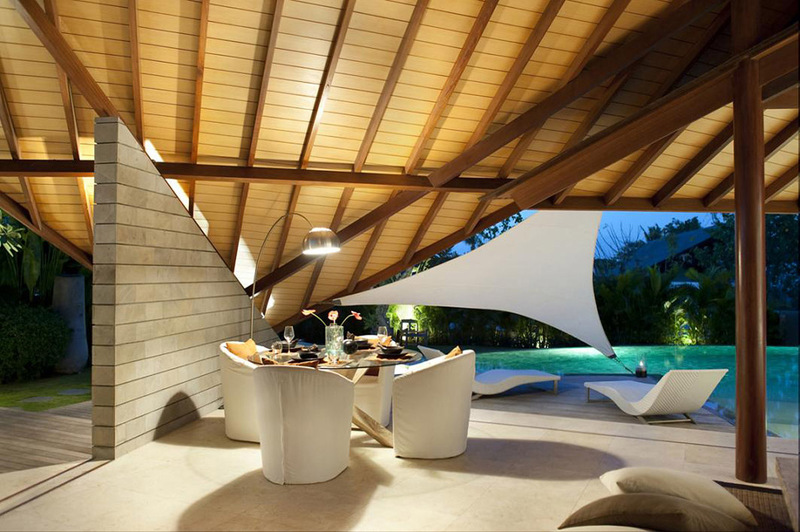 The Layar special appearance of pitched roofs that hang boldly to the floor is it’s signature appeal and this is what set’s this villa (among many other special features) apart. 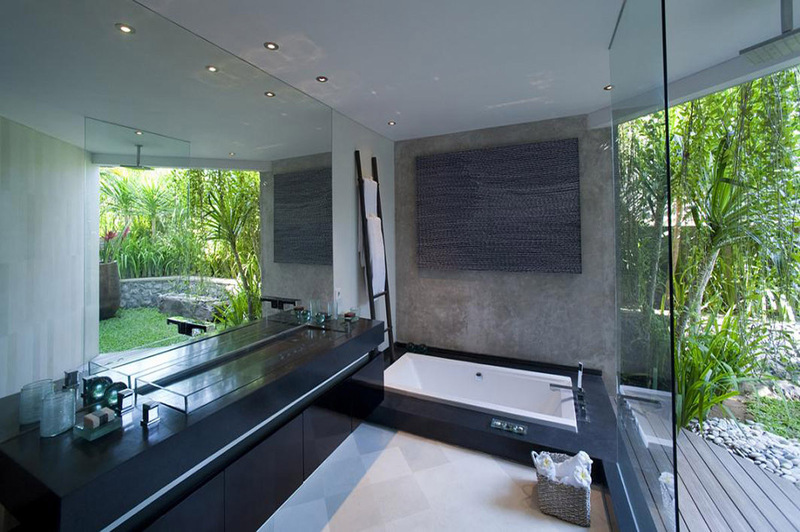 It’s visual appeal is to say the least very dramatic from both within the villa and outside. 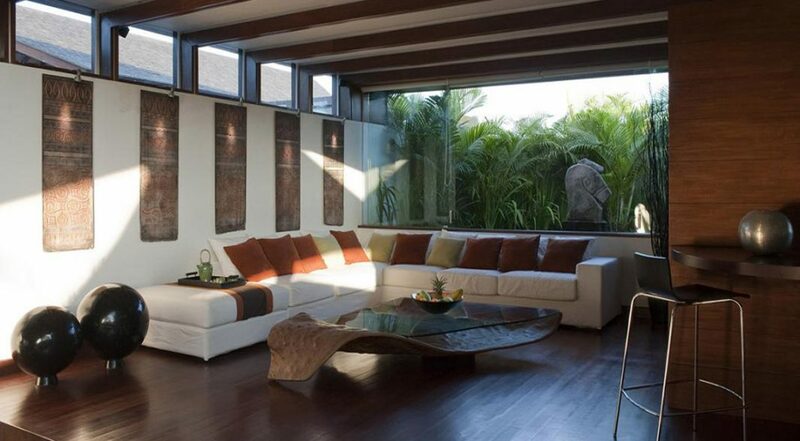 All these curved angular features combine to make The Layar and exciting roomy and light filled space that you, your family or your group will love. 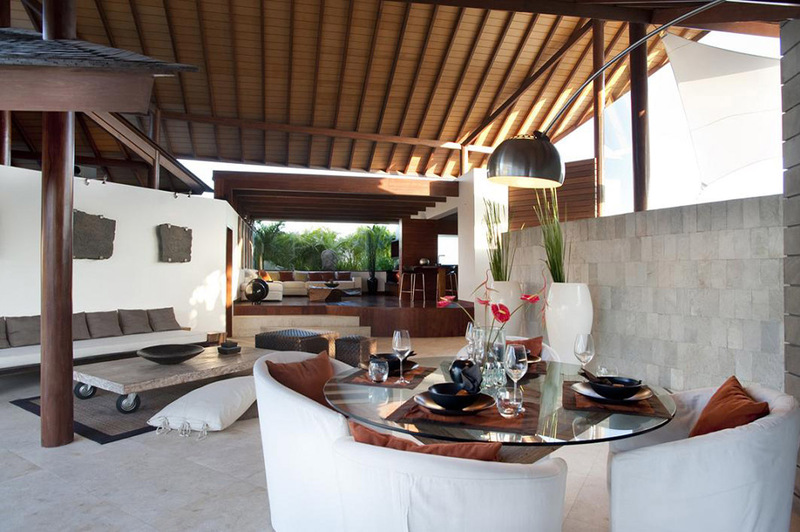 The 3 bedroom Layar villa features striking changes of floor levels to create interesting and defined spaces. 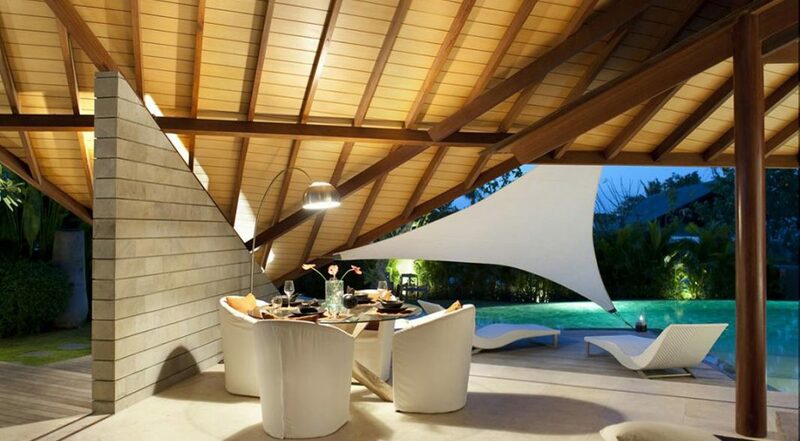 The huge open living and dining room fans out from a raised platform alongside the kitchen, widening to the garden and pool area at the front. 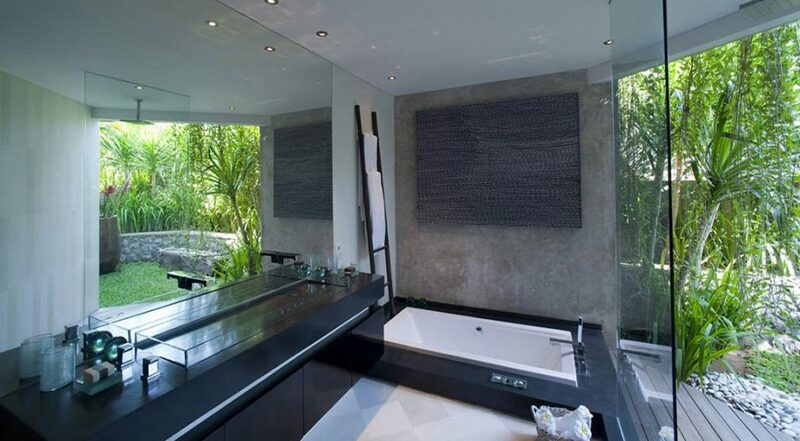 Secluded on separate sides of this vast living area, the three bedroom suites each enjoy complete privacy and outdoor space in the form of a deck, terrace or bathroom garden. 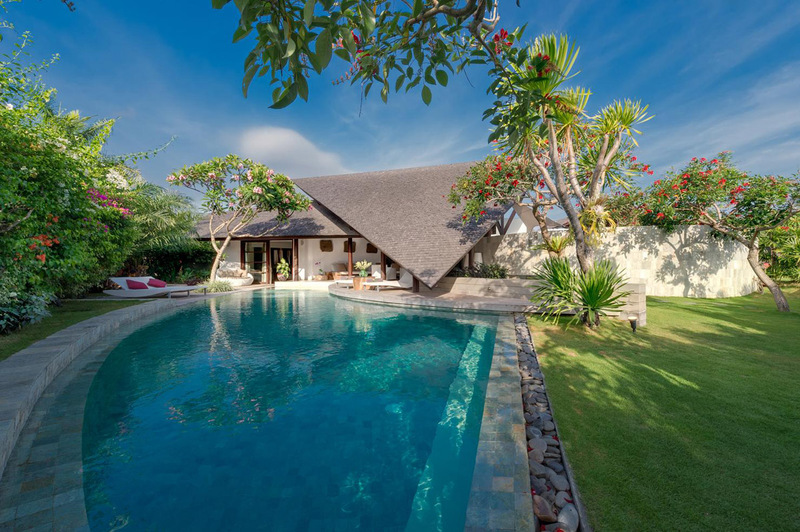 Between villa and garden is a large swimming pool with sun deck and a jacuzzi. There is a team of dedicated villa staff to look after you while staying here, making sure your fed, pampered and completely relaxed. With breakfast included and served to you in the comfort and privacy of your own villa your holiday will be even more memorable. 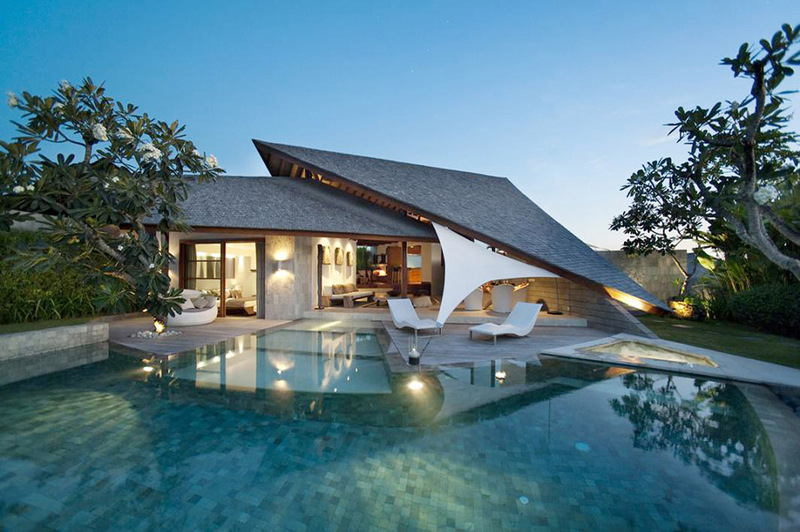 Near the villa you have all the excitement and buzz that Seminyak is famous for. Well known restaurants such as Sisterfields, Motel Mexicola, Ultimo & Cafe Bali are all within walking distance. Famous day clubs like Ku De Ta, Potato Head, Miss Sippy & Tropicola are all nearby. For the kids there’s the beach as well as Finns Recreation Club and the Waterbom Park. If your keen to take the kids out for a meal, then Johnny Rockets, Hanks Pizza and Seminyak Village are all less than 5 min away by foot. 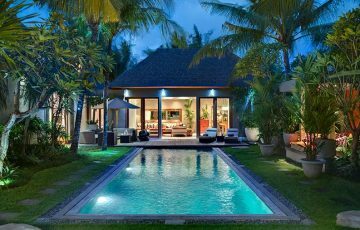 To view other luxury Seminyak villas for rent or our complete range of Bali villas near Eat Street please browse this website or contact our reservation team. 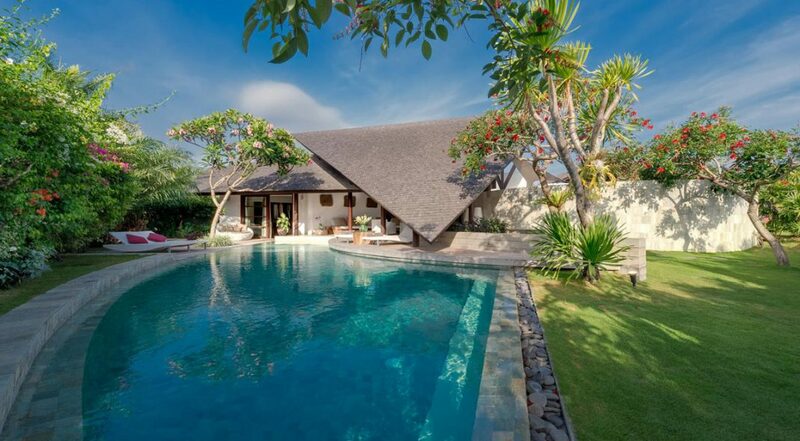 This is a popular Seminyak holiday villa rental so if you are planning a trip to Bali, especially during the Australian school or public holidays please book 3 bedroom The Layar well in advance. 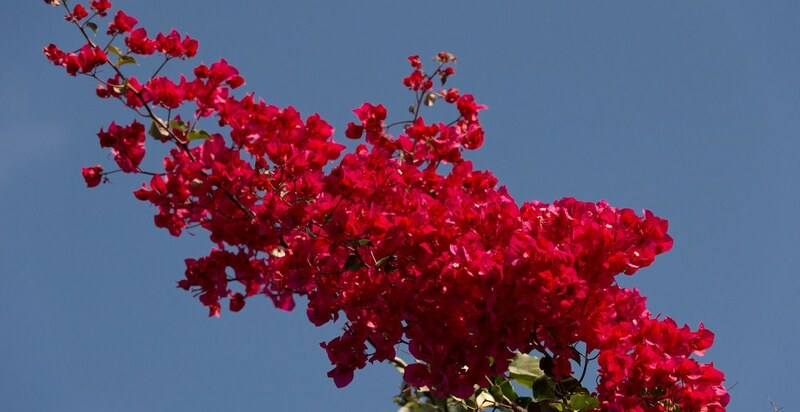 If you need anything organised please speak to the villa manager who will be able to arrange; dinner parties, reservations, car hire, tours, shopping trips, massages and advice on where to go and what to see. 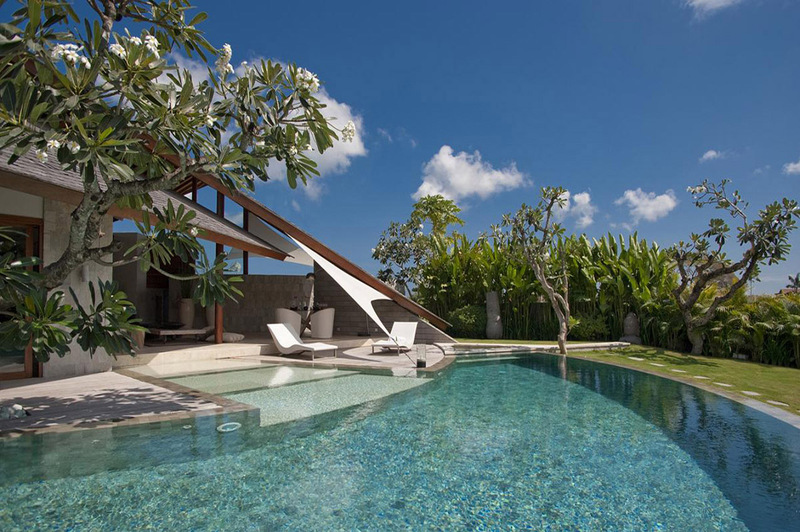 We stayed at The Layar over Christmas for a week and were absolutely wowed by the fantastic villa. We were expecting luxury before we arrived but nothing prepared us for the level of opulence and comfort we were going to have during our stay. n fact, we really didn't want to leave the villa at all to go out to nearby Seminyak and when we did, we found we just wanted to get back to our little oasis. Everything about The Layar is perfect; from the lovely & very attentive villa staff to the way they lavished attention on us to the pool, the fab location as well as the reasonable price per night - all we can say is we are counting down the days till we come back here again - 10 out of 10 for this villa without any hesitation. 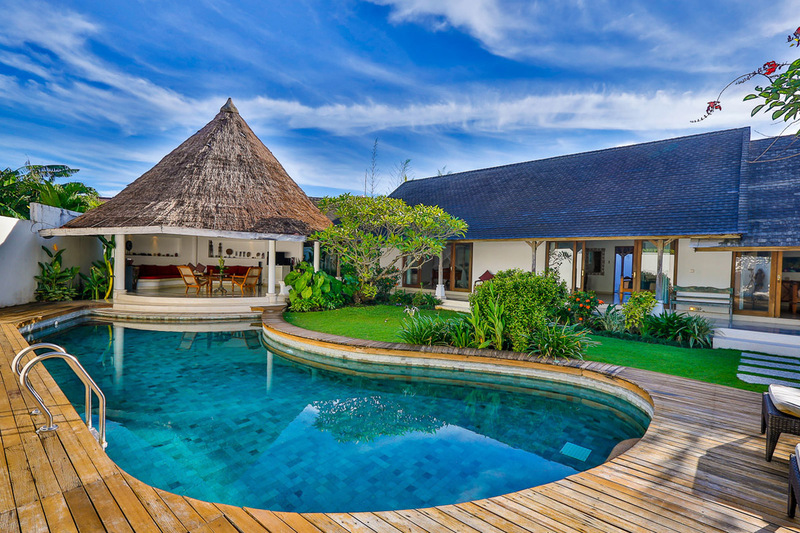 One word to describe our holiday experience at The Layar is' heavenly'. In fact, I think based on the 10 days we had here with our 3 kids I would have to add another word: 'perfect'. 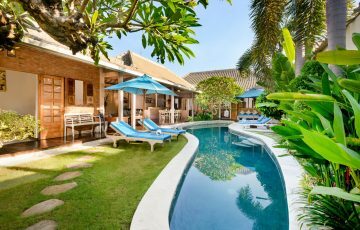 If you want to have a holiday villa experience like no other I urge you to try to stay at this villa for at least a couple of days to see what it's like. It's truly unbelievable with absolutely the best of everything. Plus as an added bonus the villa staff were courteous and made you feel very welcome during our stay. 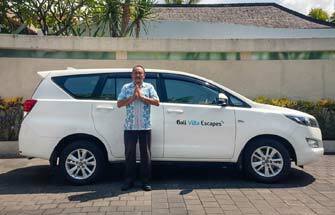 I just want to give a huge thanks to Ina and Yayuk at Bali Villa Escapes for putting this together for us and being so responsive to all my emails. 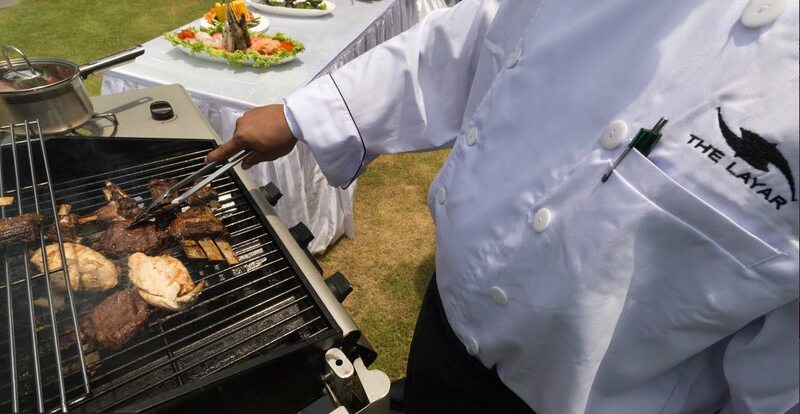 Your service and the entire experience will be remembered for a long time with fondness. 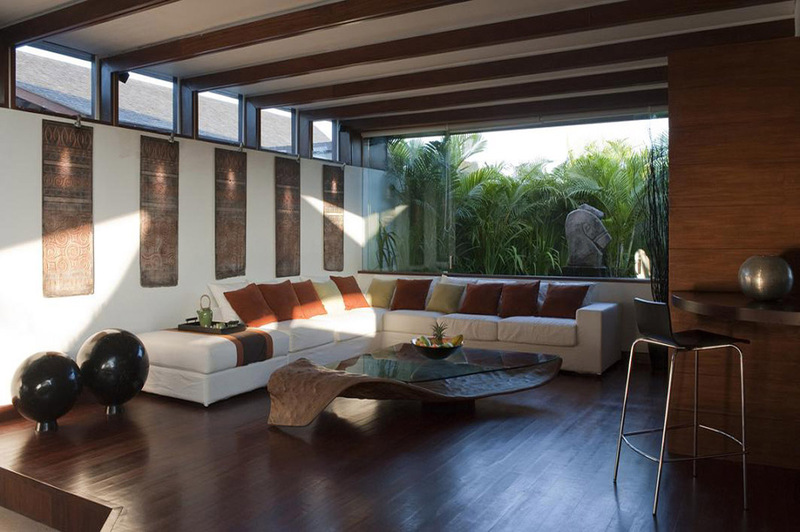 Clever design and lovely living spaces which suited our family of 5. Secure, private with very attentive staff. As regulars to Bali we will certainly come here again. What can I say except WOW!! 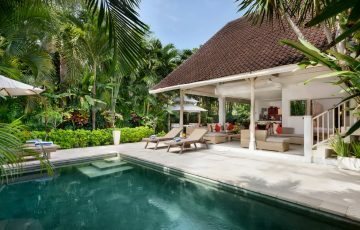 Villa was fantastic and in such a good location - so close to many really great restaurants like Sisterfields, Motel Mexicola and Seminyak Square was a 5 min walk away. A real winner. To all the staff at The Layar thanks for making our stay so wonderful. Kids can't wait to come back.